US President Donald Trump (above). Nearly every government seeks to fill gaps in knowledge and understanding, and verify its on perspectives through its own intelligence efforts. Having a full, compatible understanding of a situation through direct talks by officials, allows leaders and top diplomats to speak correctly and authentically about issues. It also improves the chances for crafting agreements. If countries desire to effectively engage with Trump diplomatically, they must ensure how and what they collect about him and the US is well-considered and accurate. In the US, the news media serves as a watchdog over government power and political activity. It is a source from which the public can inform itself on the decisions and actions of elected leaders and appointed officials. The news media is at its best when it provides the public with an intimate look inside government bodies and operations. Its role in the society is sacrosanct. “Freedom of the press” is one the Bill of Rights, the first ten amendments of the US Constitution listing specific prohibitions on government power. Admonishment can be viewed as a warning, and one may seek to encourage, improve the quality of another’s performance by warning. However, news media criticism of US President Donald Trump appears aimed at bringing his administration down. Trump’s critics also seemingly have the goal of destroying him as a person, reduce him to a demimonde. It has become de rigueur to speak against Trump. All of the negativity catches the eye. Middle of the list journalists have managed to make a place for themselves at the top by presenting anti-Trump stories with reckless abandon. The ranks of his critics actually extend beyond the US news media to include: think tank scholars, other policy analysts, particularly former officials of the Obama administration. Some of Trump’s critics are convinced that Trump does not really want to do well for the US public or the world. They make such assertions being fully aware that the consequence of them might be to harm the trust that many in the US public have in Trump. Indeed, critics may have infiltrated and despoiled the psyche of many US citizens, and perhaps may have even destroyed the possibility for some to have confidence in future US administrations, both Republican and Democratic. When Trump fights back, his comments are very rough and tough, but they unlikely do enough to prevent negative reports and commentaries, all the opprobrium of critics, from sticking. 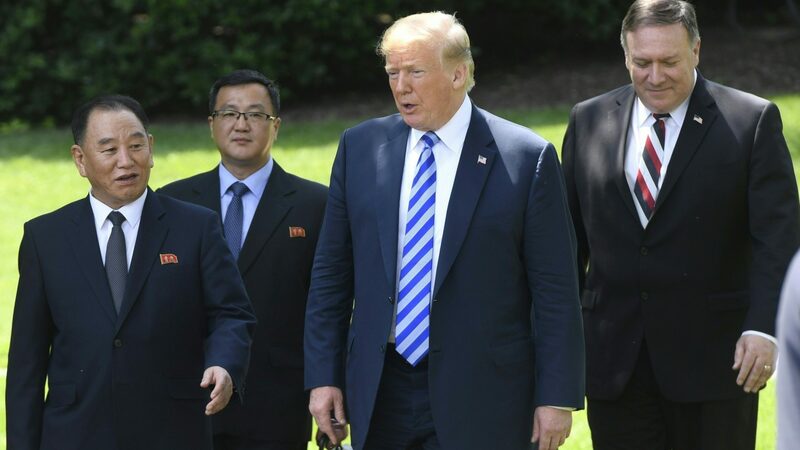 If one were to consider, for example, the coverage of efforts to organize talks between US President Donald Trump and Supreme Leader of the Democratic People’s Republic of Korea (North Korea) Kim Jung-un, one might recognize that the two leaders were not really given a fair chance to virtually relate as leaders before they met. The atmosphere was poisoned by exceptionally strong negative reports and commentary of expert observers, well-known political foes, critics, and news media pundits. What was actually being said and done in both capitals was being distorted. The main focus of critics was a back and forth on Twitter, a few awkward official statements, and predictions by experts of unconstructive behavior by Kim. What saved the pas de deux was a step by step approach toward North Korea well-managed by South Korean President Moon Jae-in and US Secretary of State Mike Pompeo. Moon met with Kim at the Demilitarized Zone. 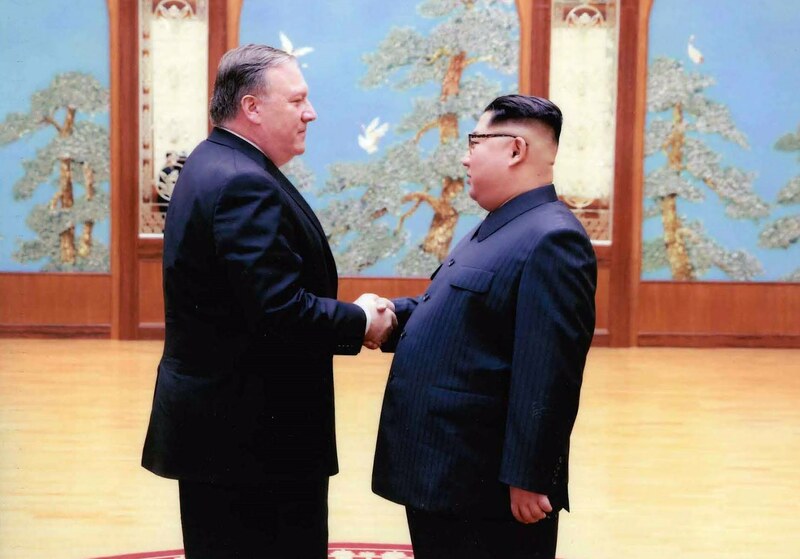 Pompeo both as Director of the Central Intelligence Agency and Secretary of State met with Kim in Pyongyang. Trump enabled their efforts by expressing a willingness to meet. The US in a way reciprocated on Pompeo’s visits by having the North Korean Vice Chairman of the Central Committee of the Workers’ Party of Korea, Kim Yong-chol, meet with Pompeo in New York City for talks and then meet with Trump in Washington, DC. Particularly for the North Koreans, having the chance to get to know Trump and Pompeo, and learning what US thinking in the administration was directly from the US President and Secretary of State was both edifying and important. What the North Koreans learned was certainly far more informative and satisfying than what their intelligence services may have been gleaned in the abstract from US news media sources and free wielding comments of experts in conferences and interviews. The meetings also likely had a stabilizing effect. 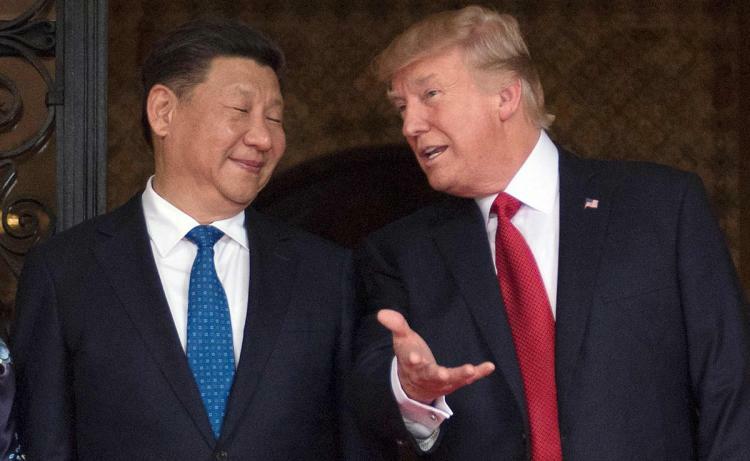 Chinese President XI Jinping (left) and Trump (right). In general, foreign leaders encounters with Trump are welcoming and friendly. During them, Trump appears at ease, self-possessed. Those who have engaged in conversation with him are usually left with the feeling that he was in the moment with them. He projects an empathy. At the same time, Trump has a strong presence, a bearing of authority, which may be intimidating to some. Trump’s nature is to try while in direct contact with an individual to create a bridge, if not a bond. Boiled down to the bones, open minded, immediate perceptions of Trump from most who have met him, from national leaders to average US citizens, would most likely agree that their encounters with Trump are welcoming and friendly. He is typically at ease, self-possessed with others. Those who have conversed with him are usually left with the feeling that he was in the moment with them. He projects an empathy. At the same time, Trump has a strong presence, a bearing of authority, which may be intimidating to the odd few. Trump’s nature is to try while in direct contact with an individual to create a bridge, if not a bond. Meeting Trump, one must remember that he has expectations from them. Red flags can be detected in his facial expression. Many discerned them too late in a conversation with Trump to repair the damage. Those who plan to create some interaction with Trump in their own way or seek to create some deal or agreement only on their terms, will accomplish nothing but raise his ire. Those simply trying to create some personal linkage alone should avoid overplaying their hand. Trump will let one know what type of relationship that he would prefer to have with one. A barrier will be created once a line is crossed. One should never try to become too familiar with him too fast. If anyone is going to rustle feathers by being a bit extra jovial during an interaction, it would need to be Trump. In such cases, he would invariably still mean well. Following that, he might try to be giving in some way. It would be better not to meet him, if one intends to go as far as breaking the spoken and unspoken rules of civility with him. Those who might use the opportunity to meet Trump in order to play to popular public sentiment at home by displaying irreverence for Trump, displaying their will to challenge him on issues, and create the optics that would confirm some silly notion of fearlessness by taking on the US President will do great disservice to their people and interests of their countries. There would be so much to gain from the opportunity to meet with Trump, and it would all be tossed away. One should not glean from what has been stated that Trump dislikes developing new relationships. Quite to the contrary, Trump appreciates crafting new things to include new relationships. That desire to create is unquestionably due to the fact that he has the mind, vision, and spirit of an artist. His successful professional paths as a businessman, land developer, entertainment promoter, and reality television host evinced that. As a businessman, Trump for decades engaged in high stakes negotiations and immersed in the granular details of forging solid, mutually agreeable deals. As a developer, he thoroughly invested himself in the planning, designing, and constructing buildings. In that process he was humble, meticulous, perceptive, and innovative. He could become lost in his art. As a media celebrity, he lived a life of high drama while he entertained and bedazzled. While very public accusations have made of alleged indiscretions, in the aggregate, the greater side of Trump is influenced by a moral center, his faith. He is a Presbyterian, and attends religious services. At the same time, he is respectful, appreciative, and has a good understanding of other religions, and often will attend their services. Trump was elected US President having never served In political office at the national, state, or local level. He reviewed US foreign policy, it successes and failures in recent years and how his predecessors got things done, and decided to apply lessons he learned in business to make improvement to enhance US policy approaches. He labelled the central concept and intent for making improvements as “America First”. Trump discovered being successful would not simply require transitioning from the role businessman to that of president. In his short period of time in office, his thinking in terms of his duty and responsibilities and also personally, began evolving. In that process of evolution, Trump has not conformed with politics as usual in Washington. Rather, Trump, while keeping the heart of America First, began a process of transformation in which life lessons on getting things done, coalesced with lessons he would learn on the job daily as president. The change that Trump has brought has been most disturbing for critics as well as allies set in their ways, preferring Trump would take buttoned-down, old fashioned approaches to issues. He has pushed back against their insistent voices that he do things their way, seeking instead to find the truth in himself and doing things his way. A very evident part of Trump’s process of evolution are staff changes. He wants advisers that will best allow for the smooth execution of his plans. A very interesting and practical duality in his thinking has also been revealed as Trump has exercised his own magic. On some matters, Trump has found, sometimes the hard way, that conventional ways of doing things are best. When he has turned to unconventional approaches, he has relied upon a shrewd inner voice, intimations of a military commander in battle, all of it honed and polished by decades of human interactions, to help guide his decisionmaking. The change that Trump has brought to Washington has been disturbing for critics as well as allies set in their ways, preferring that he would take buttoned-down, old fashioned approaches to issues. On some matters, Trump has found that doing things conventional ways are best. When he has turned to unconventional approaches, he has relied upon a shrewd inner voice, intimations akin to those of a military commander in battle, all of it honed and polished by decades of human interactions, to help guide his decisionmaking. Early in life, Trump was inculcated with a strong sense of duty, honor, and country in secondary school. Trump matriculated for five years at the renowned New York Military Academy (NYMA) at Cornwall-on-Hudson, New York. In the late 1950s and early 1960s, NYMA was the closest thing to a preparation school for the United States Military Academy at West Point, New York, which was only a short drive from NYMA’s campus. Trump excelled at NYMA. Friends and instructors have noted how Trump eventually thrived in military environment. He graduated as one of five captains, the S4 (supply officer) on the Senior Staff. In his senior year, Trump was given command of a composite company of cadets for the 1963 Columbus Day Parade, and led them and rest of marchers to St. Patrick’s Cathedral where he greeted Cardinal Francis Spellman. Among his many other accomplishments, he commanded NYMA’s Honor Guard in both 1963 and 1964. From 1960 to 1964, he was an Honor Cadet and played on the Variety Baseball team. Trump proved throughout his secondary school years that he could consistently perform well both as a student and leader. Given Trump’s successful ascent as a NYMA cadet, it is hard to imagine that within him there was not a desire to attend the West Point. However, that was unlikely his decision to make. His father, Frederick Trump, who Trump would only describe as a builder to fellow cadets, was a well-known New York City real estate developer. His father likely insisted that Trump attend Fordham University where he would educate himself for work in the family business. Trump behaved dutifully and honorably in response to his father’s wishes. What is left for observers to see from that decisive point in Trump’s life is a juxtaposition between his strong military metiér and his dedication to family and a business path. As a leader, Trump is always ready to subordinate what he might want for what he must do. Trump has undoubtedly recognized that to be a successful president he had to become a living sacrifice for his country, taking on almost limitless duties and burdens he very likely unforsaw as a candidate. The lifestyle that he led as a successful business leader had to be shed. Interests and focuses of his attention and energy, if simply for recreation, have been replaced by his country’s needs. Through visits to Mar-A-Largo, Trump National Golf Club in Bedminster, and Trump Tower, he is able to enjoy fragments of a life he once lived. It will be interesting to see where this evolutionary process will lead Trump. No one is required to say anything about it, but this aspect of Trump is minimized or ignored in reports and commentaries of critics. 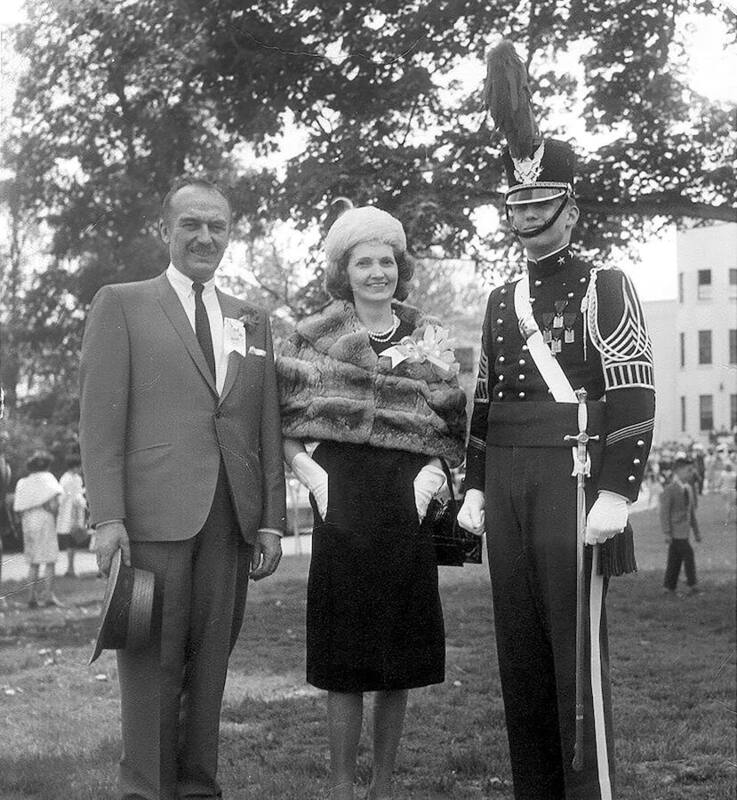 Trump’s father, Frederick Trump (left), mother, Mary Anne MacLeod Trump (center), and Trump (right). Trump was inculcated with a strong sense of duty, honor, and country at the New York Military Academy. He proved throughout secondary school that he could perform well consistently both as a student and leader. Given his successful ascent as a cadet, it is hard to imagine that he did not desire to attend the United States Military Academy. However, that would not have been his decision to make. His father clearly had plans for him to work in the family business. When national leaders do not grasp what is happening on an issue and cannot get a handle on a situation in a satisfying way, there is an anxiety, a sense of panic even, that may ensue from lacking intelligence to answer big questions or fill gaps in knowledge, to develop policies, strategies, and nuanced approaches. In some sudden and urgent situations for a country, sources for its intelligence service might be sparse, or nonexistent, and all one might have are bits and pieces from electronic collection, particularly if that capability is rudimentary. When there is no one to approach, When there is nobody present to approach anyone, whatever has been gathered by intelligence professionals from clandestine operations and perhaps electronic collection, may be supplemented and even complemented in the worst case by theories and guesswork. Among the tactics, techniques, procedures, and methods of many intelligence services of countries of various sizes and power, analytical units will mine through overt sources of intelligence, traditionally newspapers, magazines, books of certain authors, and now websites, blogs, and social media to see what information is out there. That information may also be used to supplement and even complement information that a service already possesses. Using information from overt sources to confirm things or infer things can be rather dicey as there is no longer assurance that the information is true. Without the means for verifying and confirming whether it is true, intelligence service must proceed with caution. Presently, overt sources can pose nearly as much danger as information that might be dangled before collectors by adversaries. When the wrong information is collected and presented to consumers, things can go terribly wrong. Policy and decision makers demanding intelligence, may not ask or give a cursory look at how and from where the information available was collected. Depending on how bad the situation is, those officials directly advising or supporting key leaders, rather than be palms up due to detected discrepancies, questionable findings, intimations, will pass it along as work product, demonstrating that there some type of understanding of on-going events, some handle on the situation. Consumers receiving that information might be pleased to receive verification of inferred ideas of the leadership. Those inferred ideas, with the support of new data, can often become fact and make its way from consumer to consumer, all the way to the top. In some countries, it has essentially been custom in analytical units of intelligence services covering the US, to use particular sources of intelligence, for example, US newspapers of record, as the New York Times and Washington Post, and watch and listen to NBCNEWS, ABCNEWS, CBS News. on the US. Therein lies the rub. Then Director of the Central Intelligence Agency, Mike Pompeo (left) and Supreme Leader of the Democratic People’s Republic of Korea, Kim Jong-un (right). Relatively isolated countries can easily become victims of false reports, misleading, politicized commentary. In the current environment, there is much to sift through from overt sources to find the truth. The use of bad information will result in bent intelligence. The consequence of its use, even if slight, could be catastrophic. A better way to satisfy requirements for collection would be to insist upon and invest time and effort into creating opportunities to meet at some official level with representatives of an adversary or even an ally. It could be done, if necessary, away from the public eye. In such meetings, specific questions could be asked of a foreign counterpart, and information could be provided to ones opposite number to ensure that the genuine position of another government on key matters, not the meditations of pundits or guesswork, would be run through mechanisms for analysis included will prevail in analyses. Depending upon the nature of relations between countries, the relative size of two or more countries, and the urgency or importance of issues between them, direct bilateral or multilateral talks between the most senior officials may not always be possible. For example, one may not officially recognize the sovereignty of another and perhaps visa versa. In the best case for the intelligence services of the respective countries, meetings would be held between senior intelligence officials. There may be the reality that one side may have more power to control the time and place of even such lower level engagements might be an issue for the other side to work through. Still, at whatever level officials might meet, whenever and wherever they might meet, and whether it might be a one shot opportunity, they must come prepared to collect enough information through well-crafted questions, keen listening to words, and skilled observations of behavior to satisfy intelligence requirements and prepare the best possible product for consumers. Interestingly, questions asked also can serve the purpose of informing the other side what one already knows, what one does not know, and what is most important. Questions serve as a curious form of sharing as much as collecting. Vice Chairman of the Central Committee of the Workers Party of Korea Kim Yong-chul with his interpreter. (left), Trump (center), and US Secretary of State Mike Pompeo (right). For the North Koreans, having the chance to get to know Trump and Pompeo, and learning what thinking in the administration was directly from them was both edifying and important. What the North Koreans learned was certainly far more informative than what their intelligence services may have been gleaned in the abstract from US news media sources and free wielding comments of experts in conferences and interviews. Many critics are at a point in which they simply reject possibilities without hearing others. They rely upon self-serving explanations and surmisal. Critics see their efforts as righteousness, and they see far greater moral authority in themselves than in Trump. Critics analyses of history, of what was spposedly better, is nostalgia at best, myth at worst. Previous administrations would languish in the halls of inaction on a policy issue. They seemed to gain some satisfaction by merely moving from office to office, from conference room to conference room, from building to building, writing one memorandum after another, and declaring that in itself was action. Trump would admit that some mistakes have been made and a number of situations could have been handled differently, particularly on the domestic front. However, Trump has learned lessons. Modifications have been made in the way he makes statements and approaches situations. Nevertheless, critics reject the notion that he has evolved at all, and argue that he will never change. Lacking faith in the president, they surrender all hope that he could accomplish anything good for the US. While one might normally expect some change in behavior or conciliatory attitude from critics as time passes, their civility only seems recede further. There is a Hebrew term, küwl (cool), which means to sustain a hardship, to maintain ones balance in spite of what is happening. Trump has sought to avoid having a wounded spirit, powering away from despair and disappointment. Initially, Trump, in reaction to some critics, would “imitate the action of the tiger, stiffen the sinews, summon up the blood, disguise fair nature with hard favor’d rage.” Trump has since become more selective as to when and to whom he will direct his disagreement. Few men could display true sangfroid if stress were assailing them as it has Trump. Some religious leaders would explain that a trial can present an opportunity to persevere under pressure. Moreover, one can grow in the midst of conflict. Periclum ex aliis facito tibi quod ex usu siet. (Draw from others the lesson that may profit yourself.) Political and social pressures to conform to a counter-Trump outlook appear to exist in capitals worldwide. However, for any country, relations with the US are too important to allow ties to be damaged by behavior and attitudes displayed by leaders with a skewed understanding of realities about Trump. As posited here, it would be very easy for intelligence service to provide information with a counter-Trump bent to their leaders thus creating that situation. Perhaps a decision to embrace such information would be the fact that it confirmed individual biases or prejudices those leaders might have about Trump. Many leaders who initially chose to take a stance hostile to Trump recognized that they had done a great disservice to the people and interests of their country. They subtracted such negative thinking and changed their approach to him. Others learned lessons from leaders taking a wrongful counter-Trump tact, and allowed themselves the opportunity to draw their own conclusions about him through direct contacts. German Chancellor Angela Merkel (left) and a Trump (right). After meetings in Washington with Trump from March 17, 2017 to March 18, 2017, Merkel made the harsh comment that Trump was not a reliable partner Germany and the Continent could depend upon. Her comments expressed her angst. 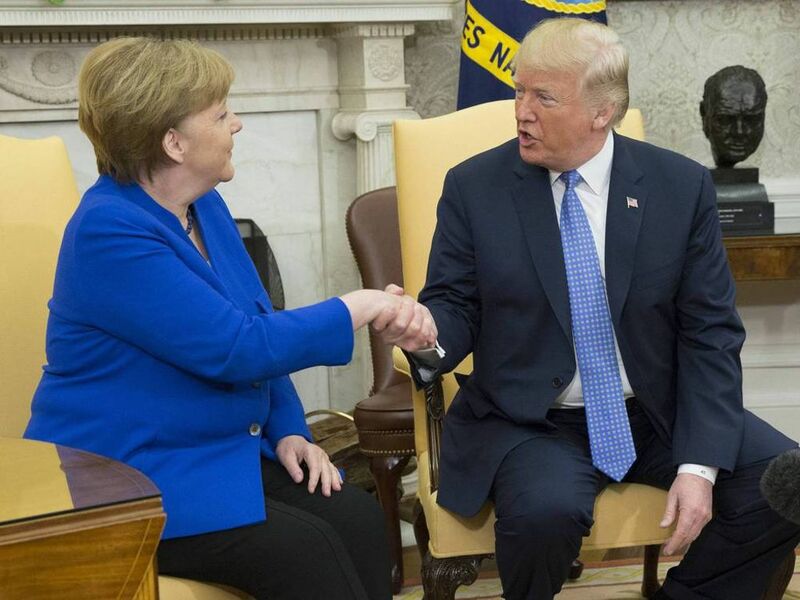 Merkel was personally disappointed that Trump initially declined to publicly endorse NATO’s doctrine of collective defense, or agree to common European positions on global trade, dealing with Russian aggression, and mitigating the effects of climate change. Following meetings in Washington with Trump from March 17, 2017 to March 18, 2017, German Chancellor Angela Merkel, hailed as Europe’s most influential leader, made the stunning comment that US President Donald Trump is not the reliable partner her country and the Continent can depend upon. She was quoted in a May 28, 2017 New York Times article as stating: “The times in which we could rely fully on others — they are somewhat over,” adding, “This is what I experienced in the last few days.” Merkel went on to state: “We have to know that we must fight for our future on our own, for our destiny as Europeans.” Her strong comments represented a potentially seismic shift in trans-Atlantic relations, as she has concluded without reservation that the US is now less willing to intervene overseas. The Times article explains that Merkel was personally disappointed that Trump declined to publicly endorse NATO’s doctrine of collective defense or to agree to common European positions on global trade, dealing with Russian aggression or mitigating the effects of climate change. Merkel’s comments were truly an expression of angst. Her words would lead one to believe that the current period, rather than being of change, and reinvigoration, is languid and dissolute. Yet, as a result of her statement, she may have also stirred concerns in the capitals of other NATO countries over how they will defend themselves against their most likely opponent, Russia, and handle other matters, without the US. Merkel apparently took inventory, reviewed what had transpired in March 2017, and reconsidered the direction she, as German Chancellor, wanted her interactions with Trump to take. During her three-hour visit to the White House on April 27, 2018, her exchanges with Trump were very cordial. 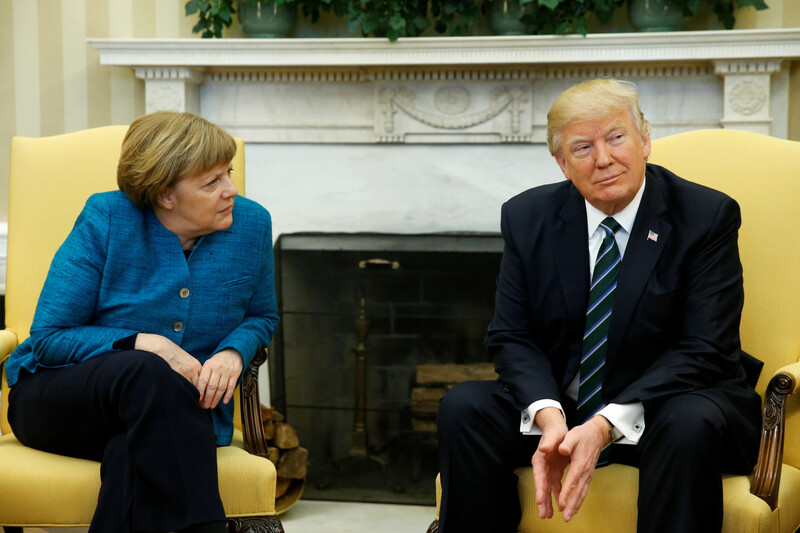 Merkel discussed but did not emphasize her differences with Trump on steel and aluminium tariffs and the Joint Comprehensive Plan of Action. In a joint press conference afterward, both stressed the long-time ties between the US and Germany. Some foreign leaders from the get-go fully understand that their focus during meeting with Trump should be their countries’ interests and relating well with the US President. They should not be prompted by the news media to speak or behave in ways that would aid its narrow interest in grabbing headlines to promote readership and viewership, and to fill advertising space and increase their profits. On April 30, 2018, Nigerian President Muhammadu Buhari had the opportunity to visit Trump at the White House to discuss urgent and important issues concerning his country. Buhari was the first sub-Saharan African leader to be invited for talks with the Trump administration. Trump and Buhari agreed that fighting terrorism is a priority for both administrations. The US sold 12 counterinsurgency aircraft worth $496 million to Nigeria to help in its fight against Boko Haram jihadist insurgents, despite previous refusing to approve the sale due to human rights concerns. Trump let Buhari know that he wanted Nigeria to remove trade barriers and allow imports of US agricultural produce. 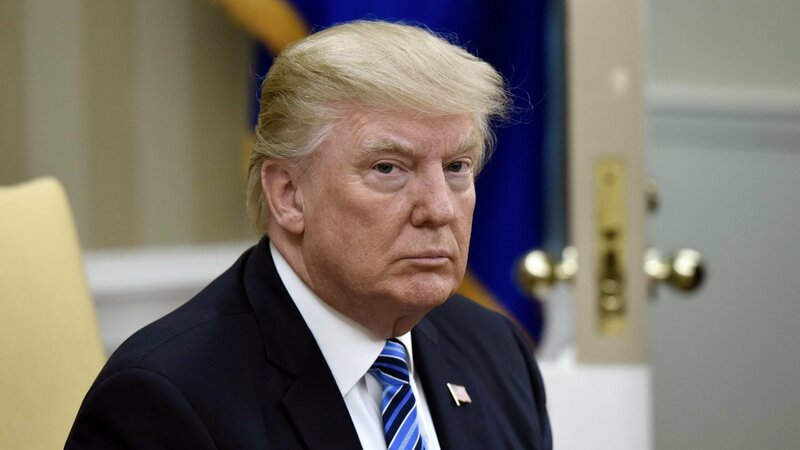 What was not discussed were disparaging remarks Trump allegedly made concerning African countries on January 11, 2018. 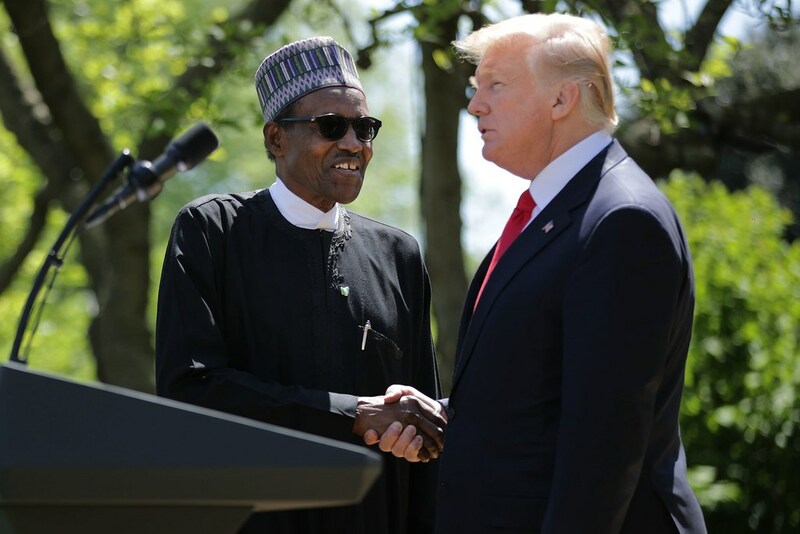 However, when Trump and Buhari held a joint press conference in the White House Rose Garden, the Nigerian President was asked about Trump’s alleged complaints about immigrants coming to the US from Haiti, El Salvador and some African nations. Buhari was very aware of problems between the news media and Trump and aware more so of his duty to serve Nigeria’s interests. He astutely replied: “I’m not sure about, you know, the validity of whether that allegation against the president is true or not.” He added: “So the best thing for me is to keep quiet. When French President Emmanuel Macron visited the US from April 24, 2018 to April 25, 2018, he came with the purpose to bridge differences over the Iran nuclear agreement, encourage Trump not to withdraw so fast from Syria, exempt European countries from then prospective US steel and aluminum tariffs, and discuss the Paris Agreement on climate change and global warming. 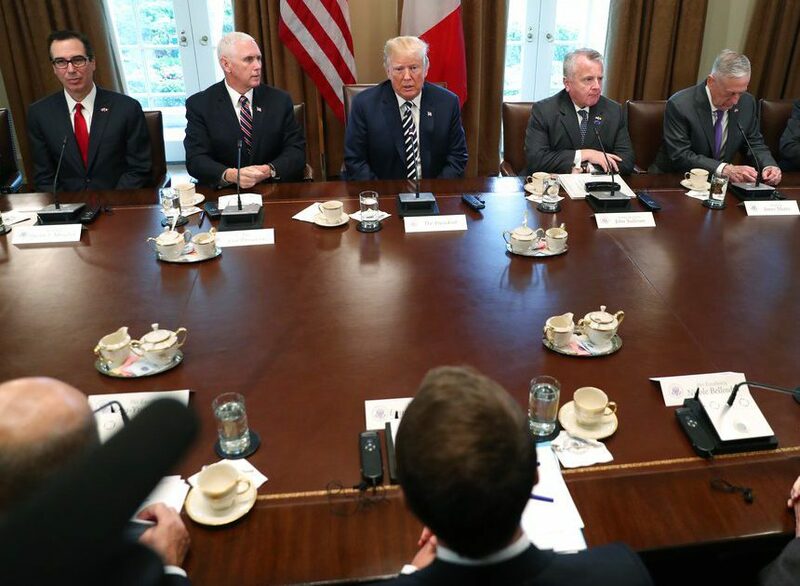 Indeed, Macron told Trump that France recognized the need for the US and France to work together to defeat terrorism, curtail weapons of mass destruction in North Korea and Iran, and act together on behalf of the planet. At the same time, Macron emphasized the importance of the Franco-American relationship, the commitment and the bond between the two countries, its historic importance and importance for both countries and world into the future. The next day, at a joint press conference, Macron focused on the relationship between the US and France, Macron said, “History is calling us. It is urging our people to find the fortitude that has guided us in the most difficult of times. France and with it, Europe, and the United States have an appointment with history.” However, through a translator, Macron again got down to business, stating: “Mr. President, please allow me to go back to a number of issues, which are fundamental for not only our relationship, but beyond. The first topic is Iran. You said once again, in front of the press, what your position was during the campaign and as well as the President of the United States. It’s not a mystery we did not have the same starting positions or stances, and neither you nor I have a habit of changing our stances or going with the wind.” On his last day in Washington, Macron, in flawless English, addressed the US Congress. Although Macron spoke critically to an even greater degree of a number of Trump’s foreign policy, trade and environmental decisions, he did so in a well-considered, methodical way, always leaving real hope that at some point a meeting of minds could be reached. Critics put off by the congenial interaction between Trump and Macron. Their friendship was derided as “Le Bromance” and critics groaned that there were “exaggerated handshakes and a pair of kisses.” Macron was referred to as a “Trump whisperer” because he converses with Trump often by telephone. Critics seemed to find solace in the belief that Trump’s relationships with other European leaders are more strained. While the idea emphasized, it is not necessarily the case. Critics also noted that Trump ended his first year in office without receiving a foreign leader on a state visit, the first president in nearly 100 years to fail to do so. 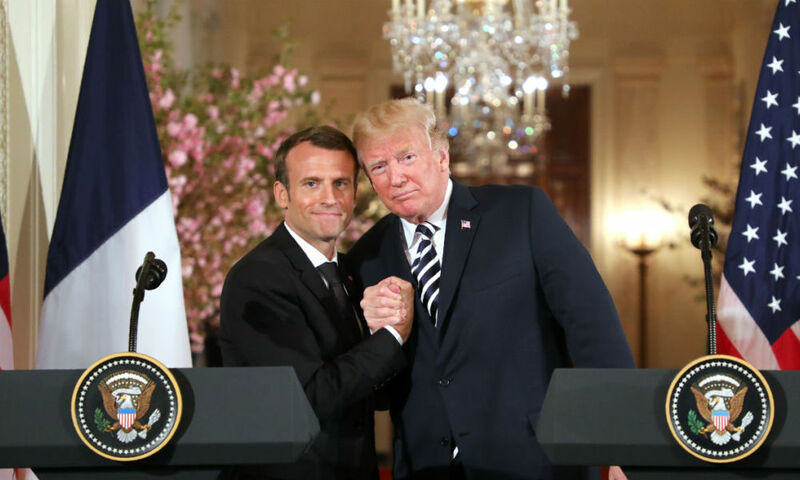 French President Emmanuel Macron (left) and Trump (right) When Macron visited the US from April 24, 2018 to April 25, 2018, he hoped to bridge differences with Trump over the Joint Comprehensive Plan of Action, encourage him not to leave quickly from Syria, prevent prospective US steel and aluminum tariffs on European countries, and make headway with Trump on the Paris Agreement on climate change. Macron spoke critically on a number of Trump’s foreign policy, trade and environmental decisions, but did so in a thoughtful way. He also emphasized the importance of the Franco-American relationship and his friendship with Trump. In Act I, scene iii, of William Shakespeare’s The Tragedy of Macbeth, Generals Macbeth and Banquo have already defeated the invading armies of Ireland and Norway. As they cross a moor together, they encounter three witches. The witches hail Macbeth as thane of Glamis–his original title–and as thane of Cawdor. The witches also declare that Macbeth will be king one day. They call Banquo “lesser than Macbeth, and greater,” and “not so happy, yet much happier”; then they proffer that he will never be king but his children will sit upon the throne. Once the witches vanish, Macbeth and Banquo stand baffled and speak skeptically of their prophecies. However, two of King Duncan’s men, arrive. One tells Macbeth that the king has made him thane of Cawdor as the witches prophesized. While Macbeth is intrigued that the witches words came true, Banquo warns: “That trusted home Might yet enkindle you unto the crown, Besides the thane of Cawdor But ’tis strange: And oftentimes, to win us to our harm, The instruments of darkness tell us truths, Win us with honest trifles, to betray’s In deepest consequence.” The agendas of foreign governments are usually single-minded. They will try to push the US to use its wherewithal and capabilities in a way that favors their countries positions. Some national leaders have projected a sense of apprehension about approaching Trump to improve their countries’ conditions, enhance military, diplomatic, political situations, or at least maintain the status quo. Some partners, much as competitors, have pushed hard with their respective agendas with the US from a counter-Trump perspective. Both the impetus and confirmation of their thoughts, words, and deeds can usually be sourced from reports and commentaries of Trump’s critics. Naturally, discord has obtained as a consequence of taking such an ill-considered tack. Critics have painted a portrait of Trump, and through it, a personality of Trump is conveyed, but it has always been their version of him and it has never been complimentary. They see no style, grace, creativity or intellect in the ways in which he has addressed foreign policy issues. They insist that a dictatorial mayhem exists in the Trump administration and only the worst foreign policy decisions could possibly flow from it. As explained here, one route such thinking from critics can travel to national leaders is through their countries’ intelligence services. Those services might be willing to allow intelligence reports to be colored with information from overt US sources produced by critics openly hostile toward Trump. That information, in turn, would confirm leader negative views of him. That information could “betray with deepest consequence.”. This entry was posted in #Trump, ABCNews, America First, Angela Merkel, Berlin, CBS News, Central Intelligence Agency, China, CIA, Demilitarized Zone, Democratic People's Republic of Korea, denuclearization, Fordham University, German Chancellor Angela Merkel, Germany, God, Joint Comprehensive Plan of Action, Kim Jong-un, Kim Yong-chul, Mar-A-Largo, Mark Edmond Clark, NATO, NBC News, New York Military Academy, Nigeria, Nigerian President Muhammadu Buhari, North Korea, NYMA, Paris, pundit, Pyongyang, Supreme Leader of the Democratic People's Republic of Korea Kim Jong-un, The Tragedy of Macbeth, Trump, Twitter, United States, United States Military Academy, US Military Academy, US President Donald Trump, US Secretary of State, West Point, William Stephenson by greatcharlie. Bookmark the permalink.